Fremantle is a small city on Australia's west coast and 10 miles southwest of Western Australia's capital of Perth. Cruise ships dock in the city close to the main railway station where it is a quick and easy journey to Perth. Australia's currency is the Australian dollar (AUD). Bills are plastic with coins for $2 and under. Australia has eliminated the penny and cash transactions are rounded up or down to the nearest nickel. Taxes are inclusive on sticker prices of items and tipping is not common. Money exchange can be done at any bank. When changing money, make sure you get a good rate and don't pay commission. ATM's are readily available. Tipping is not customary in Australia. The Swan Bells - a modern bell tower with an observation deck level inside by the ferry wharf. Chimes at noon. Kings Park - Take either bus #37 (weekdays) or #39 (weekends) from St Georges Terrace. Take the train to beaches along the coast northwest of Perth. Perth's main pedestrian shopping areas are just south of the railway station on Hay and Murray St. Chinatown is just north of the railway station. 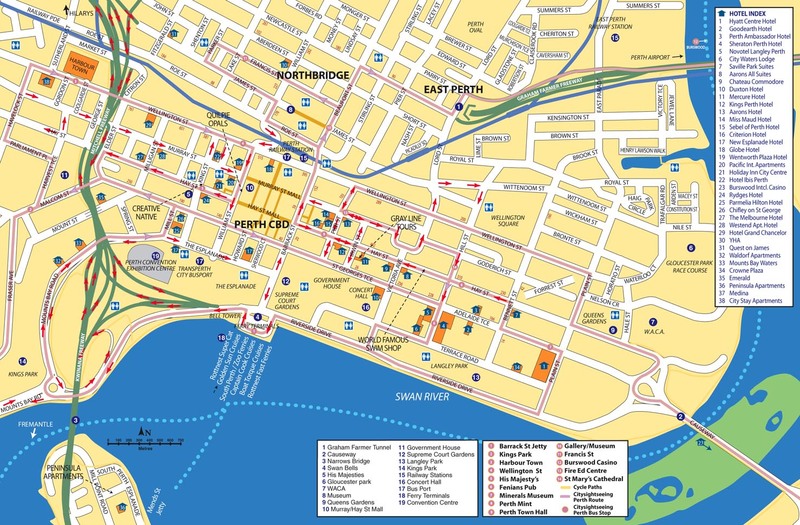 In Fremantle, there are restaurants on the Market Street and around fishing boat harbour. Woolstores Shopping Centre with a Coles supermarket is across from the railway station.